I have been MIA this month because my mom and I went to Hawaii for 2 weeks. We just got back on Sunday. Before I left I made this "BEAUTY" of a card. 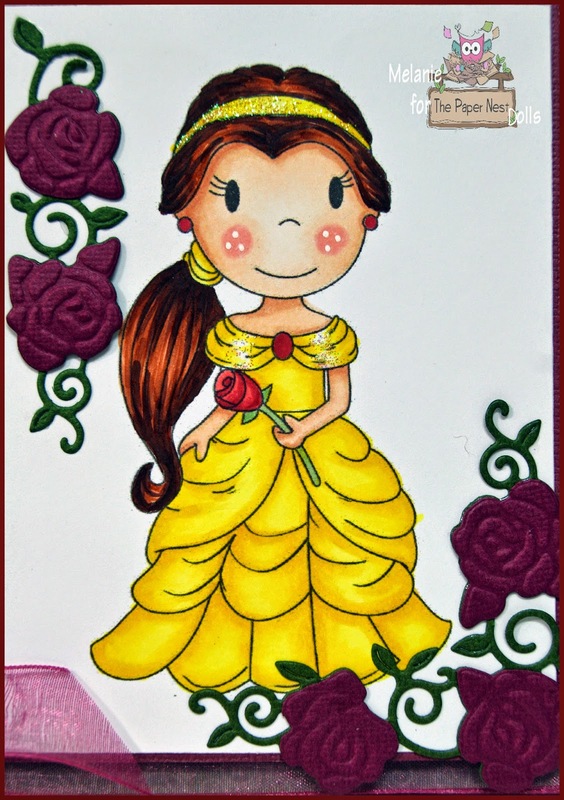 My husband's and my favorite animated video is "Beauty and the Beast" so I colored the new release called "Princess Rose" to look just like her. I will be giving this to my amazing husband on Valentine's Day. 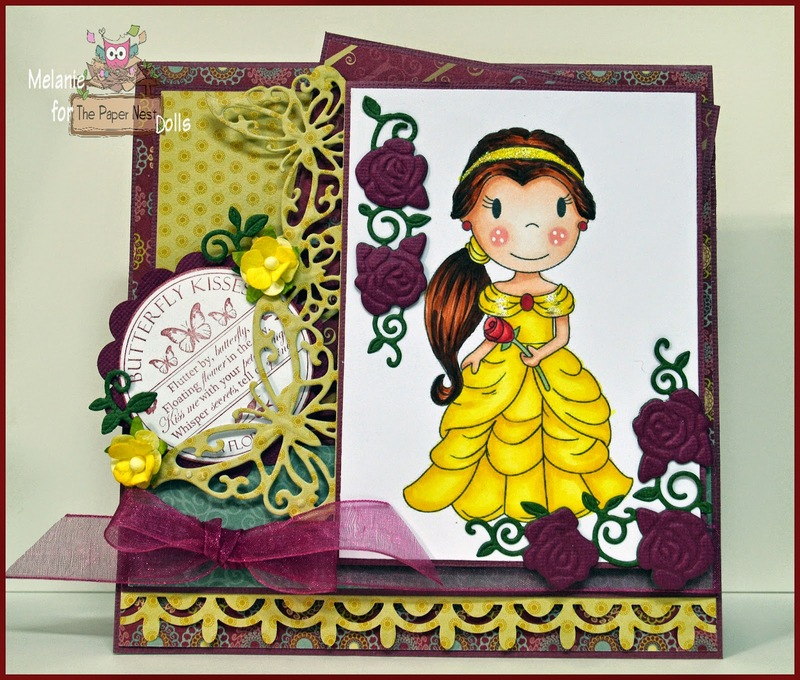 "Princess Rose" is a Paper Nest Dolls stamp and is part of the new "Fairytale Collection". 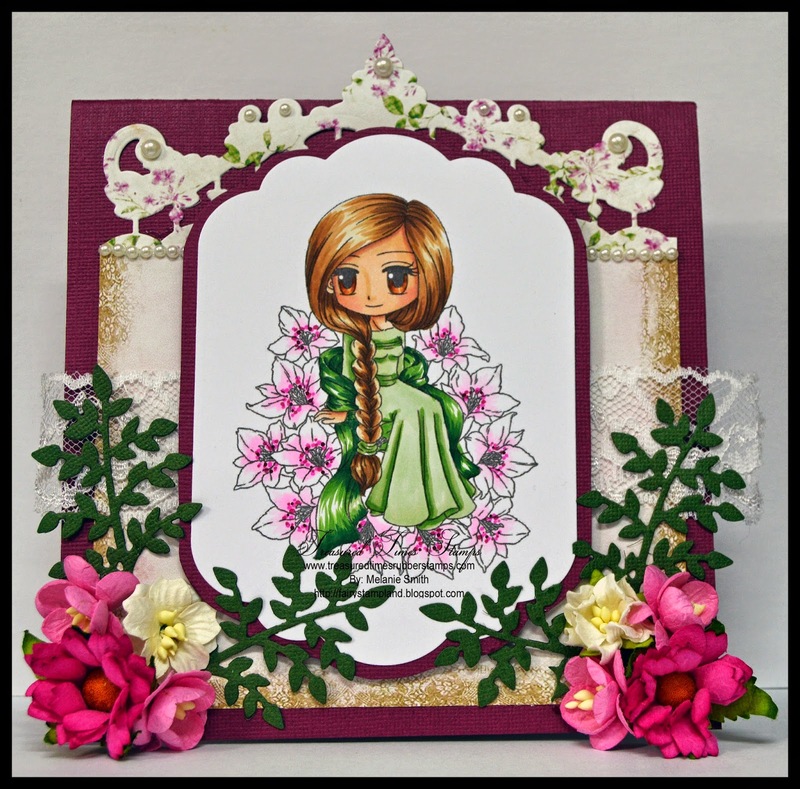 Make sure to check out all the new Fairytale stamps over on "The Paper Nest Web Site"
As you can see here I absolutely Love Noor! 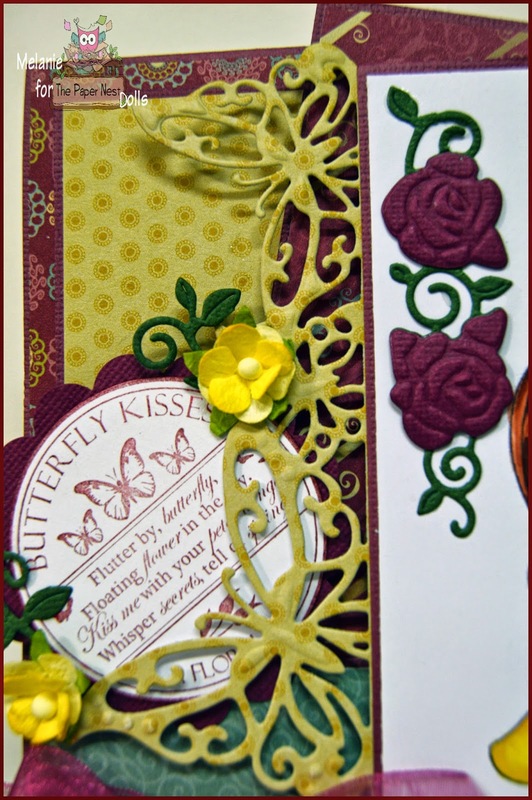 Designs dies by Joy Craft. I have just mastered the embossing feature with these dies and they are really magical. She is a true beauty and I hope my husband loves his card! Treasured Times CHA Blog Hop!!!! 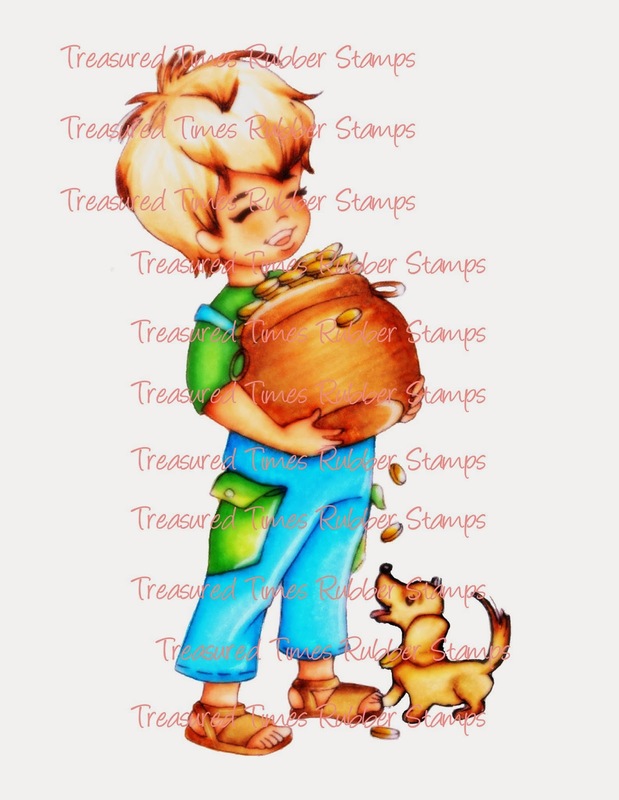 Hi everyone and welcome to The Treasured Times CHA 2015 Blog Hop Party! Today I am in route to Hawaii to spend two GLORIOUS weeks with my mom. So I will be absent for a few weeks but will return soon and will be back posting and participating with all my blogs. Today we're releasing several adorable stamps and two new paper packs at the (Craft & Hobby Trade show) CHA in Anaheim, California. We're so excited to be a part of this years show! My art work is actually on display at the CHA Treasured Times Booth both in the company banner, the package inserts, as well as my cards being on display. I am hoping this time next year I can be there in person. That is one of my crafty goals this year. 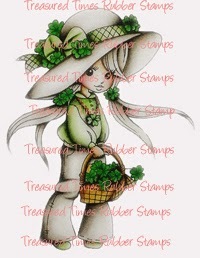 The stamps and paper packs we're releasing today are perfect for card making for the upcoming Easter & Saint Patrick's Day holidays! Let's get this party started by showing you our adorable new stamps and paper packs! 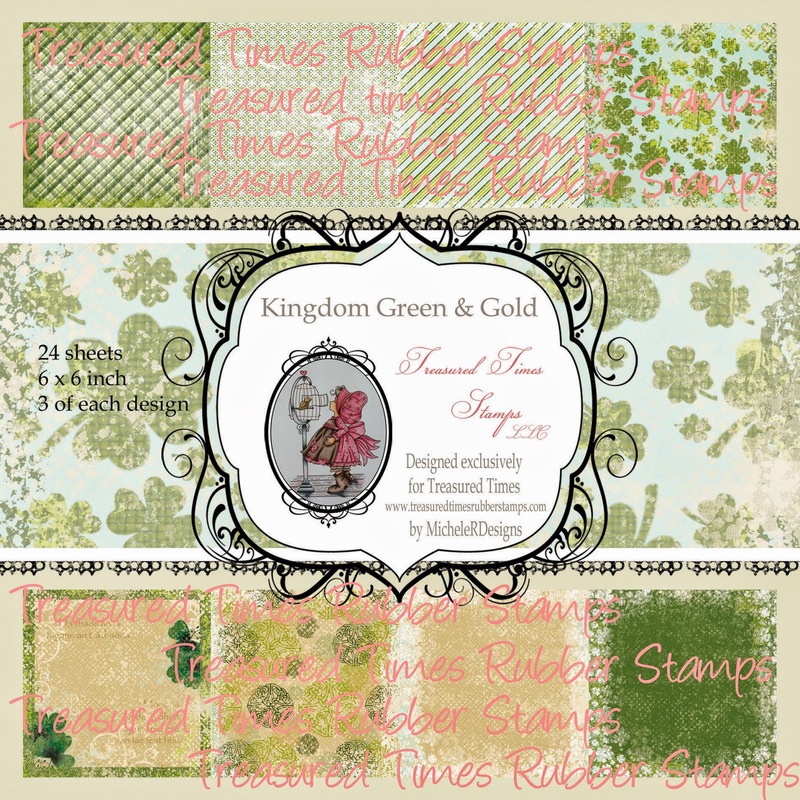 This new paper packs are called Kingdom Green & Gold & Easter Greetings. both designed by the amazing Michele Roos. I cannot express how much I love these papers. 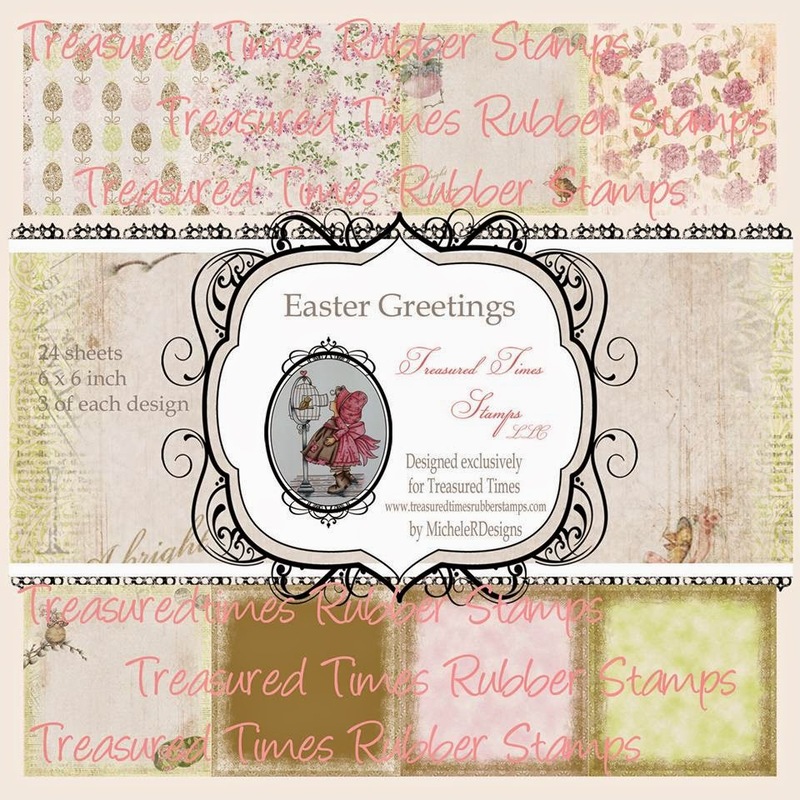 Scroll all the way to the bottom of this post to see my card sample using Easter Greetings. Now for Our New Stamps! 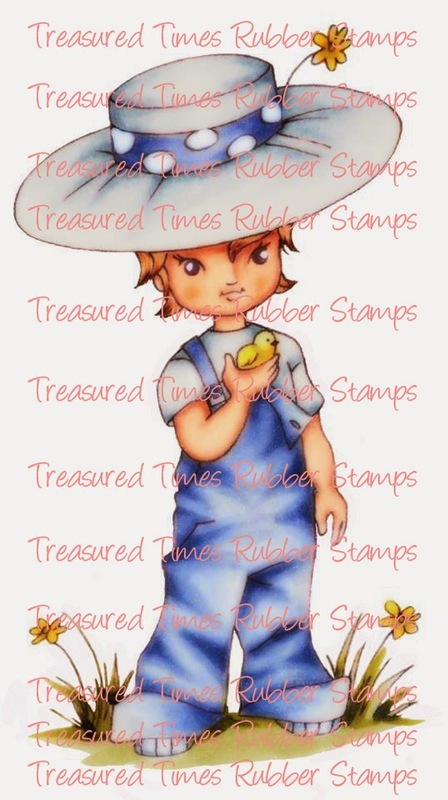 Spring Chick by Elisabeth Bell. Dragonfly Love by Elisabeth Bell. Golden Boy By Elisabeth Bell. Lucky Caitlin by Elisabeth Bell. 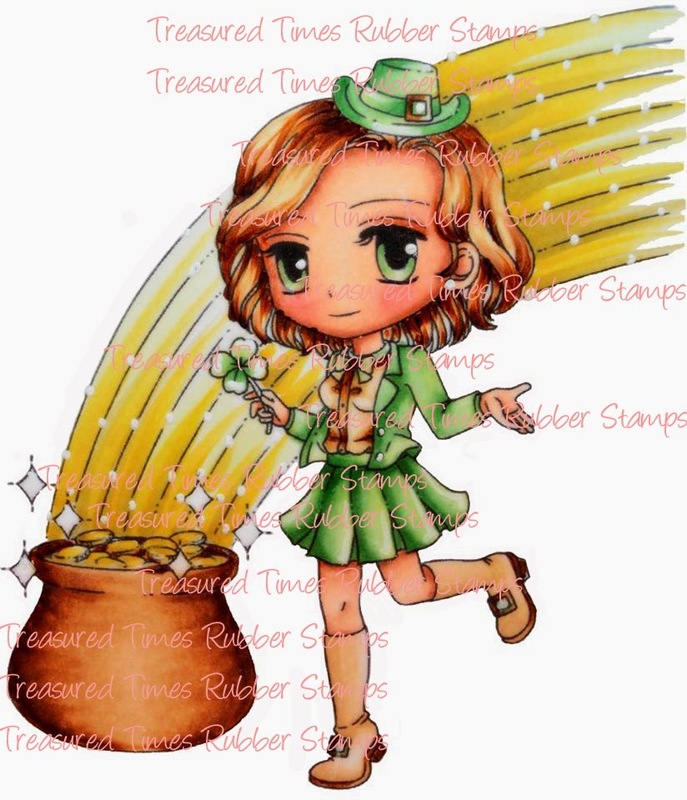 Lucky Leperchaun by Mi Ran Jung. Lily by Mi Ran Jung. 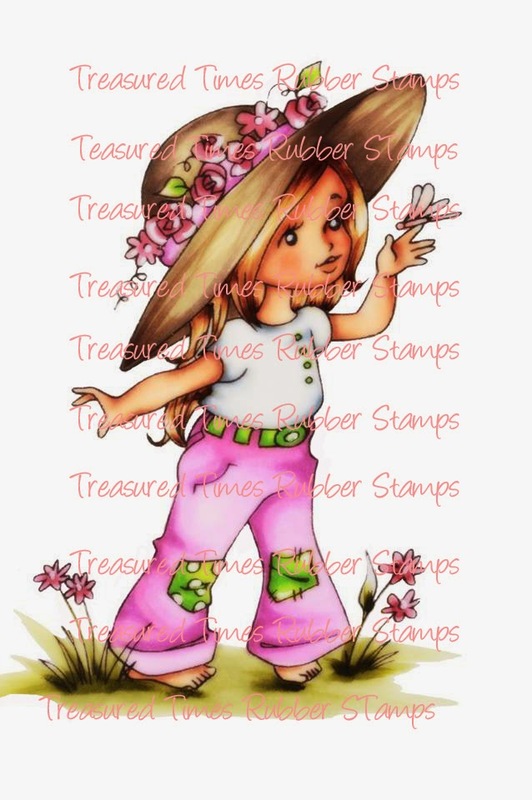 Isn't both the stamp AND the paper dreamy??? 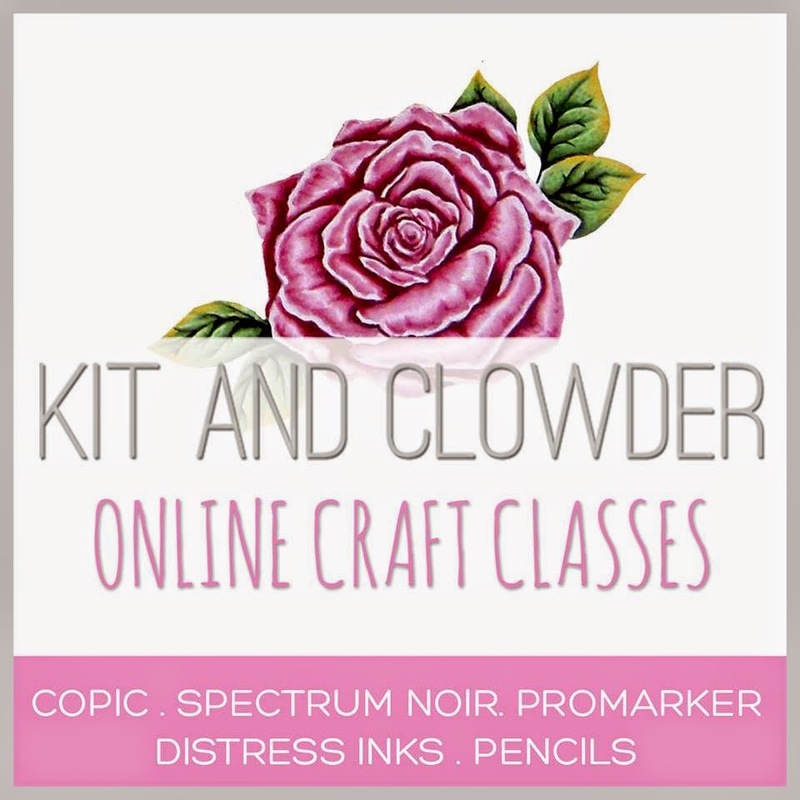 Now that we've shown you all of the adorable new stamps and paper packs lets get the hop started! 1 Lucky winner, will win all the stamps and paper packs shown here today. To be eligible to win the prizes please leave a comment on all the blogs including this one, and like our Facebook page here. 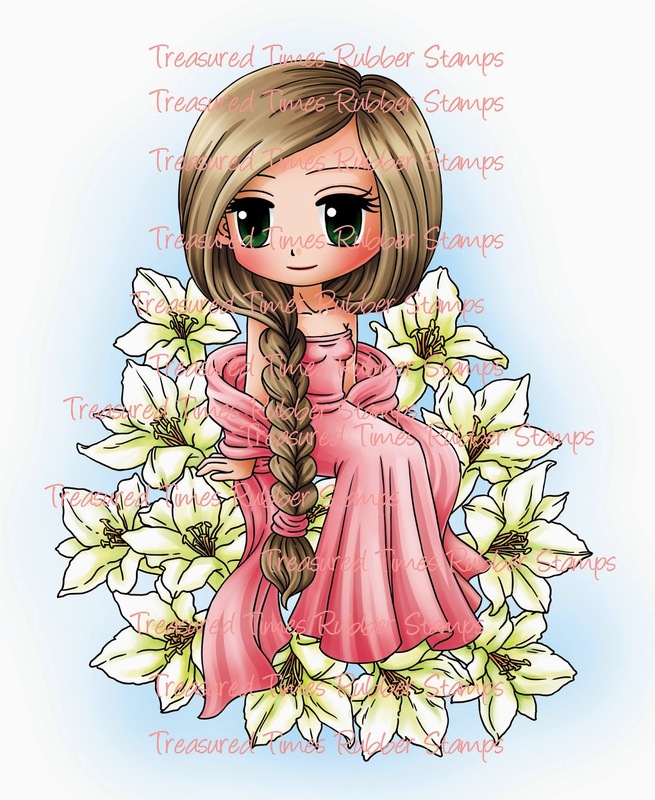 We had the opportunity to work with the Sennelier DT, and their team made some projects using our new "Lily" stamp designed by Mi Ran Jung. You can take a look at their projects here. Thank you Jolanda and all the wonderful members of her design team for being a part of this release! Thank you all for coming and hopping! I hope you all enjoyed seeing all the beautiful projects by both design teams!